Sturgeon has long been considered the most delicious fish. Dishes from it are a perfect treat for the festive table. If you want to surprise and please your guests, prepare this wonderful fish whole. Sturgeon baked Gently to Eviscerate the fish, wash, slightly sprinkle it with salt and RUB the inside on the outside. Leave it for about 5 minutes. Then again wash the fish carcass in cold water, dry it with a towel and let them dry out. Now again thoroughly salt the carcass of a sturgeon inside and pepper, add spices in small amounts. A little sprinkle fish with lemon juice and brush it with vegetable oil. Pick the right size form, place it in two layers of foil and brush with oil. Place on foil carcass sturgeon, add dry wine, carefully seal the foil and put in preheated oven for 5-7 minutes. Then remove the form carefully open the foil and coat the sturgeon again a small amount of vegetable oil. Again put in the oven and continue baking the dish until fully cooked. Take a sturgeon, and put it on a nice serving dish. Decorate it with thin slices of lemon, sprigs of fresh parsley, mint leaves. Serve the fish with the juice, formed when frying. Sturgeon stuffedFirst prepare the basis for jellied fish. Put on a wide dish with greens, cut from potatoes and boiled carrots seahorses, sea stars and place them around the dish between the greens. Prepare jelly according to instructions and pour over the dish. Put the dish in the fridge for 30 minutes. Now prepare the stuffing for fish. To do this, grate the carrots on a coarse grater, onion cut into small cubes, season with a little salt and cook. Boil potatoes in salted water, mash, add flour, egg, and chopped green onions. Put layers: potatoes, stewed carrots, onion, finely chopped dill. Clean the sturgeon from the inside, rinse well, salt inside, put inside the fish and stuffing sew the belly with cooking string. Place the fish on a baking sheet and place in oven with temperature of 200 degrees. Sturgeon bake for 50 minutes. 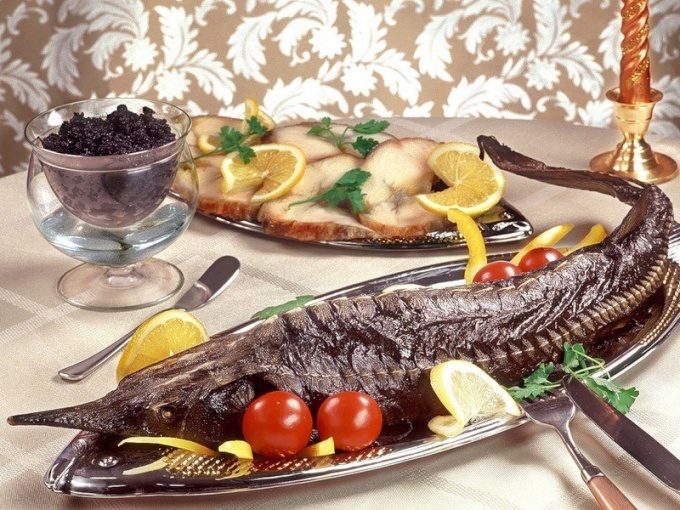 Ready the fish, after it has cooled, arrange on a plate with jellied vegetables and garnish with sour cream, black olives and red currant berries.